click here We provide a home for light business aircraft, antiques, classics, warbirds, sport aviation, and homebuilt aircraft. 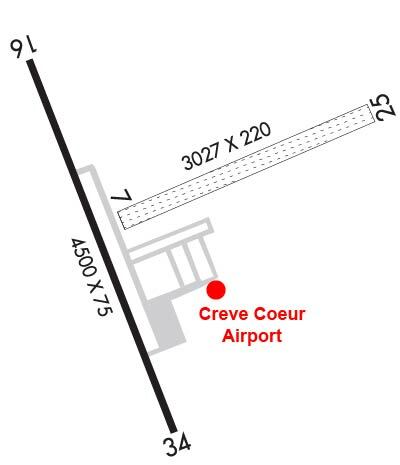 Our central location is a great bonus for aviation enthusiasts who live in St. Charles County as well as St. Louis County. Airport Lighting Schedule MIRL RY 16/34 PRESET ON LOW INTST; TO INCR INTST & ACTVT REIL RYS 16 & 34 - CTAF. Traffic Pattern Altitude 650; TPA 1000 FT AGL FOR ACFT OVR 12500 LBS. RYS 07/25 & 16/34 CLSD TO TGLS. CALL AMGR FOR INFO ABOUT TWY & APRON STRENGTH. BE ALERT TO INCREASED ANTIQUE ACFT OPS ON AND INVOF ARPT ON WEEKENDS. HELICOPTER OPS ON & INVOF ARPT. HOVER TAXI TRNG OPS ARE CNCTD PARLLEL TO RY 07/25. 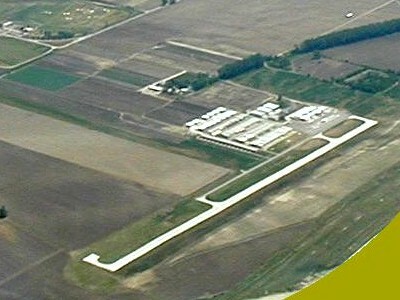 RWY 16/3 4 RY 16/34 RESTRICTED TO ACFT 12,500 LBS MAX GWT OR LESS; PPR FOR ACFT EXCEEDING 12,500 LBS CALL AMGR ON 314-878-6400. Marking Condition: FAIR; RY 16 MARKINGS FADED. Marking Condition: FAIR; RY 34 MARKINGS FADED. Comments: Comments: BRUSH, SMALL TREES, 4-12 FT, 60-200 FT FM RWY END AND 90 FT RIGHT.